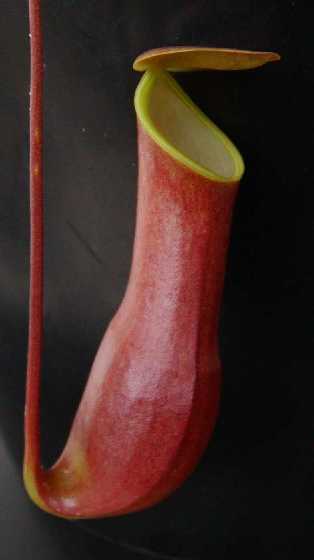 Nepenthes reinwardtiana comes in a few color varieties now. It used to be primarily green, but now has some red options. 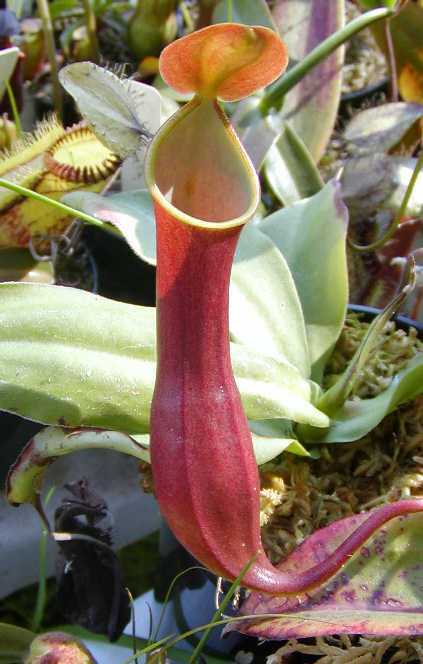 I grow three varieties; N. reinwardtiana "red bulbous", "pasia red" and "f". 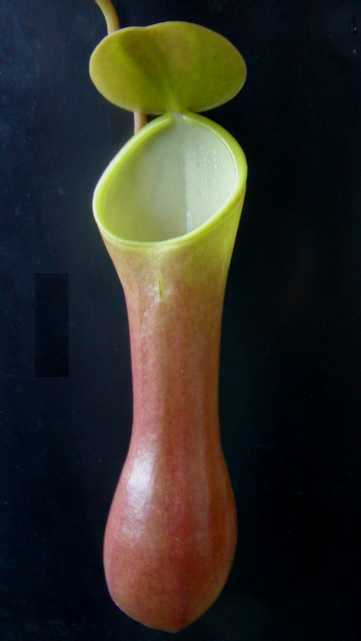 This species is known for its 2 "eyespots" located on the back wall of the pitcher. You can't see them in this picture, but you can find them in various carnivorous plant books etc. 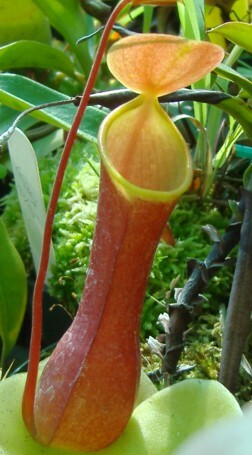 N. reinwardtiana is a vigorous species that can be grown as a lowlander, intermediate, and highlander. I grow my three varieties outdoors yearround mainly because N. reinwardtiana occurs in highland altitudes and I have very limited indoor growing space. My three varieties do slow down considerably in winter. My red bulbous variety tends to suffer more in winter than my red forms. My guess would be that both forms would prefer intermediate to lowland conditions over highland conditions. Other vendors have told me that N. reinwardtiana is a quick growing species that roots well from cuttings. If I were to grow these guys as indoor plants, I would suspect they would be quite a bit bigger than they are now. I think N. reinwardtiana would be an excellent candidate to experiment with as a windowsill plant because it is relatively inexpensive and a vigorous grower. If grown outdoors, expect slow growth in winter with possible leaf damage, but will rebound nicely when warmer temperatures return.